Fishwives, Witches, Writers, Pelicans, And Scientists: From 1647 when Goodwife Reynolds and her husband John violated an act in Court that “no women shall live upon the Shoals”; to June of 1674 when Goodwife Tope of Gosport was accused of “being a witch”; to 1839 when Celia Laighton and her family arrived on White Island to begin what would turn out to be an explosion of artistic, literary, and travel destination creativity; to the 1873 murder of two Norwegian fishwives; to the 1902 tragic drowning of seventeen Oceanic hotel staff; and to the 2013 appointment of Jennifer Seavey as the Executive Director of the Shoals Marine Lab. 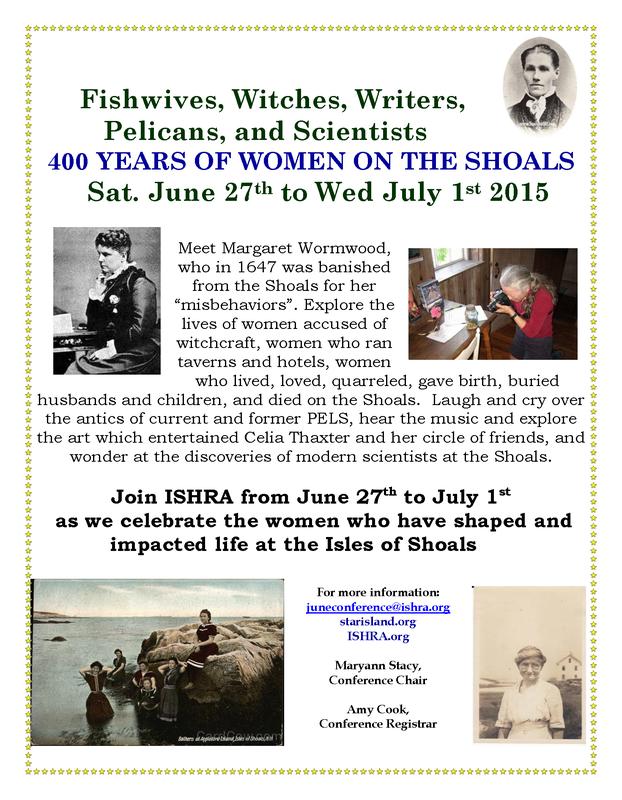 For over four hundred years women have played an active, important, and often overlooked role in Shoalers work and community life. 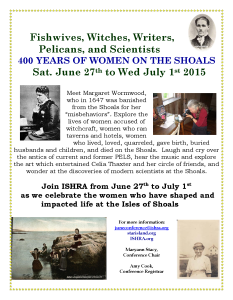 We will explore the lives of these women as a group and as individuals, looking at them in the context of their time in history and the impact they had in supporting and shaping life on the Isles of Shoals. Online registration is now open. For more info, click here. Or contact Amy Cook, Registrar, at juneconference@ishra.org or Maryann Stacy, Conference Chair, at mstacy@townofogunquit.org. This entry was posted in Events, June Conference, News on December 1, 2014 by cbd232. Join us on a journey through eons of time as we explore the ever changing conditions in the Gulf of Maine from prehistory into the future. We will investigate sea level rise and its impact on the local coastline, the rise and fall of animal populations, and changes in the environment in the Gulf of Maine. How do all these ecosystems interact and where is our place within them? 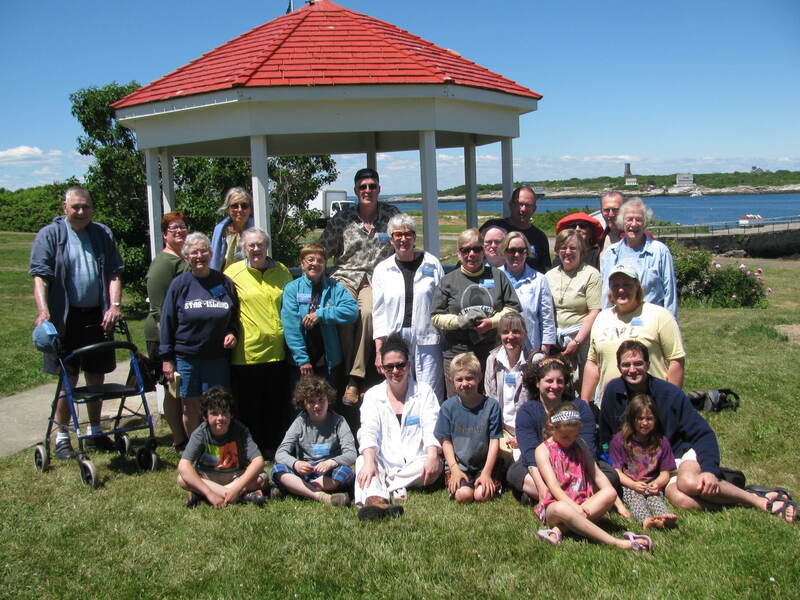 Join us for educational guest speakers, lively discussion groups, and hands on exploration of the traces of changes left upon the island landscape, as well as much loved Star Island traditions of Candle Light Chapel Service, PEL Show, and a few exciting surprises. This entry was posted in June Conference on March 6, 2014 by cbd232.